Thank you to those of you who have kindly reported spotting my fabric designs out and about. Since I license designs to other companies to print, I have no way of knowing which customers buy the finished yardage from them and make it into fabulous things. 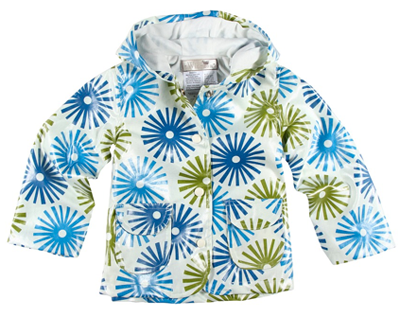 Like clothing—check out the adorable raincoats by Widgeon Kids at Zappos. Those raincoats are simply to die for. Obviously, you do wonderful design work! I love the raincoats. I want one in an adult size! How fun for you -- it is like a never-ending treasure hunt! Love the raincoats. These are way too awesome. How do you live with your awesomeness?! Sharon, well. It's tough, really. But I try. Heh heh. You have it in laminate or do they do that as part of their apparel line? The raincoat folks must have had it laminated. It's a good job I already have a totally cute raincoat otherwise I would be ripping those off the backs of small children. You can buy lamination at most chain fabric store. You should be really excited- these are so great! My husband and I were in Newburyport, MA last night and saw some of your fabric made into something cute (can't remember what now--I was just noticing the fabric) in a shop window. 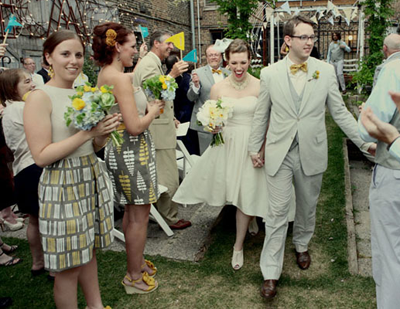 The raincoats are adorable, and the wedding is too awesome. I love the vintage look! That has to be so exciting to see your designs being used in so many exciting ways. I know a few people in Chicago who have used Jeremy. His work is beautiful! I saw a commercial on the TV the other day (I think it was for cotton) and I saw fabric on a dress that reminded me of your designs. Don't know if it was or not but would be cool if it was! I spy your ribbons on dog/cat collars here! Oh wow! That seller has the campers and some of the Leaflet pattern, too. Thanks for the tip! Oh fun! For both the designs and your stumbling upon your fabrics in this way. It's like a cool scavenger hunt surprise. 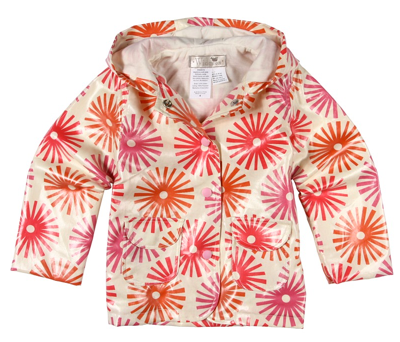 How could you NOT smile wearing these sunburst coats in the rain? These bridemaid dresses are the best. I love yellow and grey. I am so into those colors right now. Wish I was that creative on my wedding! Love the raincoats! Your fabric designs are the best Jess! Didn't think it could get better than the raincoats (and I want one in Adult size)... and then I saw the bridesmaids' dresses. Wow. Love the raincoats with your fabric. They should make them in adult sizes too! I love the bridesmaid dress patterns. It looks way better than those usual pastel colour outfits. I just spotted more of your fabric on Oh Franson website. She's made cute zippered bags with them. So cute I love the skirts! There was definitely a presence at The Sewing Summit in the form of some bags, I love the line!! That's fun to hear. Thanks, Pétra! Mary, thanks for the tip. I'm off to have a peek. Mod Flower Drum Shade - love it! Yes, and it made my day!! The bridesmaid's skirts are SO classy!